Shoreline Yacht Club has been named the Organizing Authority for Border Run 2, a new race which will be held on Friday, June 29th. 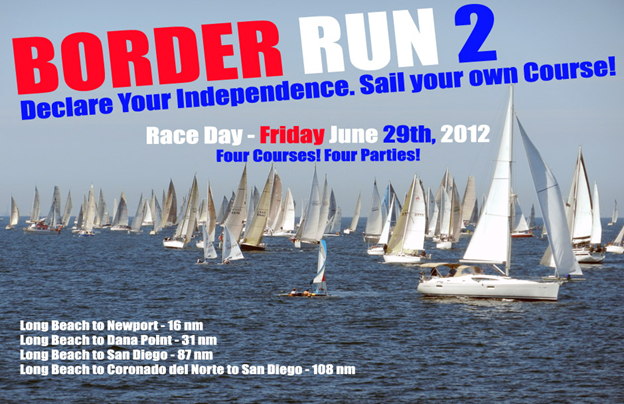 As you see above there will be four different courses from which the racers can choose, finishing in either Newport Beach, Dana Point or San Diego. Although this year’s Border Run which was held in early March drew 235 racers, our target for this as a new event is 100 boats. The picture shown above is the start of the 2012 Border Run which featured one start on one start line for all 235 boats racing over three different courses. In order to showcase our Club and make this an event that racers will look forward to in future years, we will need lots of volunteers especially at the start. If you are interested in volunteering your time, drop me an email at the address below.